Coolclean is your single source location for all fibreglass cooling tower repairs. Our experience in surface preparation and sealing delivers maximum protection against water leakage. All solutions are tailored to suit specific conditions. Following surface preparation, fibreglass matting and resin is laid to deliver a water-tight fibreglass structure. We then apply a fibreglass Flowcoat (or topcoat), for a smooth, glossy, non-porous, waterproof finish. Long-lasting protection in harsh cooling tower environments. Our repair solutions are delivered efficiently, on time and on budget – programmed to minimise the impact on your operations. 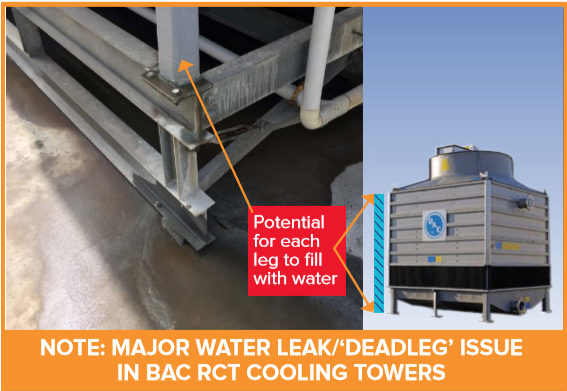 BAC RCT Fibreglass cooling towers are having major issues with water leaks from the corner leg columns. Please do NOT seal the leaks at the base. Doing so will cause the legs to become a ‘dead leg’. The leaks must be repaired correctly to avoid causing a potential Legionella risk. Coolclean can repair these leak issues correctly. If you have these towers, contact us for more information.